Today I’m going to show you how to make extra-large dumpling wrappers big enough to make king-sized Korean dumplings. Korean dumplings are called mandu and these wrappers are called mandu-pi. 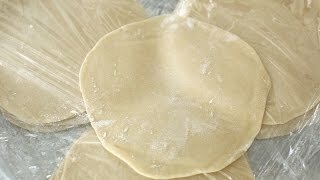 Ever since I posted my first mandu recipe in 2008 many people who don’t have access to a Korean grocery store have asked me how to make the wrappers at home. It lead me to develop this recipe, which took me some time to perfect. From experimentation I learned that homemade mandu-pi are a lot tastier than mandu-pi from the grocery store. They are big noodles used to wrap around fillings, so taking time and care to get them right will make your dumplings that much better. Not only that, but they are easy to make! This recipe makes king-sized wrappers (or skins), but you could also use this recipe to make smaller wrappers, too. Just divide them into smaller pieces before you roll them out. Enjoy my recipe, and I hope you make some nice delicious mandu-pi from it. Let me know how your mandu turn out! Take the dough out of the plastic bag. It will be a little softer and moist and easier to handle. 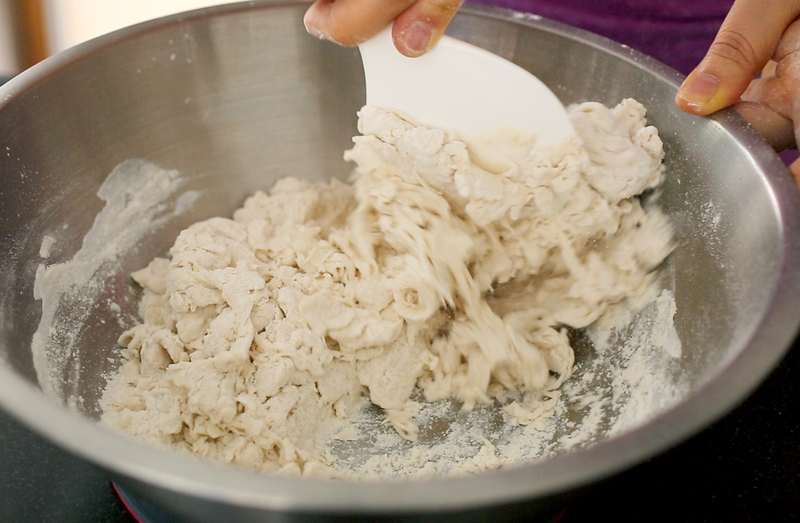 Knead it for 5 to 7 minutes, until it’s smooth and elastic. Place the dough on a cutting board dusted with a bit of flour and divide it into 2 equal pieces. Put one half into the plastic bag to keep it from getting dried out as your work on the other half. Cut the piece of dough into 8 equal sized pieces. 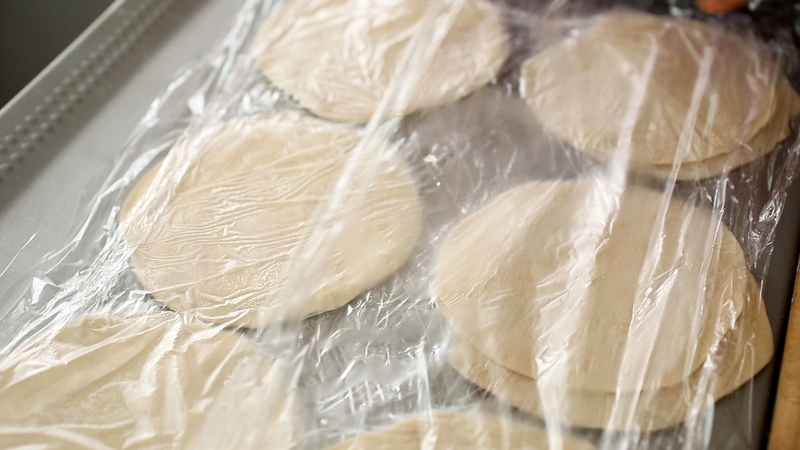 Roll each piece out with a rolling pin into 5½ to 6 inch round circle disks. They should be a little thinner on the edges than in the middle, because we’ll eventually be pinching the edges together when we make mandu, so you don’t want them too thick and doughy. 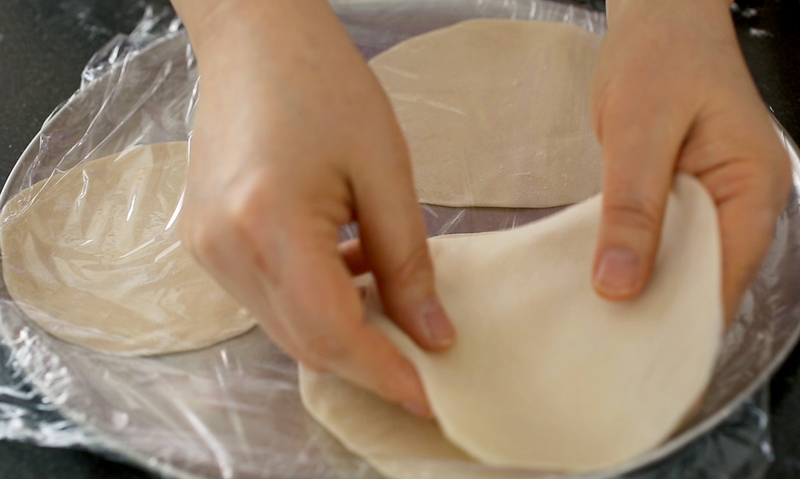 Take the second half out of the bag and make mandu wrappers out of it using the same method. Use them right away to make mandu, or freeze them for later. Cover a large platter with plastic wrap and put the wrappers on it. Place them so they don’t touch each other, and separate layers of skins with sheets of plastic wrap. When it’s full of skins, cover the entire tray with plastic wrap and freeze it for up to 1 month. Thaw out at room temperature for 10 to 20 minutes before using them to make mandu. Posted on Friday, August 29th, 2014 at 9:17 pm. Last updated on May 27, 2016. Posted January 12th, 2019 at 9:20 am | Log in to reply. Posted August 18th, 2018 at 2:53 pm | Log in to reply. Look what I found in my local supermarket today! A Mandu Maker! Certainly gonna be helpful to a non professional cook like me, saving me lots of time. 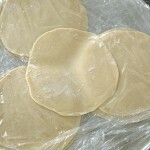 It´s a set of 5 each, from 2 1/4 inch (5.5 cm) up to 6 inch (15.5 cm), so you can even make king size Mandu with it. 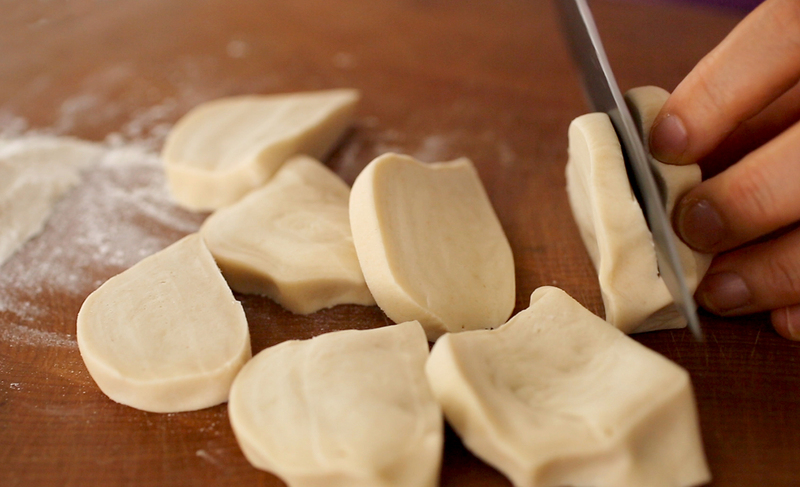 I´ll soon be making Mandu again, which is one of my favorites. Then I´ll let you know how it works for me, including a pic or two. Posted August 18th, 2018 at 2:55 pm | Log in to reply. Posted August 22nd, 2018 at 8:55 am | Log in to reply. Posted July 2nd, 2018 at 1:54 pm | Log in to reply. Mi first try at Mandu-Pi. First fresh ones I used for Mandu in chicken broth: turned out fine. Next day I made fried Mandu. The dough had become sticky and very elastic in the fridge over night, but it worked well enough with some skill, and dusting them with flour, and sticking the edges together with egg white. So I definitely used the wrong flour. Tasted delicious though, with some Dakgangjeom sauce. Posted April 23rd, 2018 at 4:43 pm | Log in to reply. Hi Maangchi, it’s me – again! I want to make some gluten-free dumplings for a friend who is celiac, so I guess I can use glutinous rice flour, yes? I would mix it with a little potato starch. I guess they would definitely change flavour and texture; maybe using this kind of dough, they’re called something else completely! will using the glutinous rice flour and cornstarch be enough, or should I add another (gluten-free) medium? Do you already have such a recipe? You’re such a wonderful lady; so patient with those of us who ask and ask and ask so many questions, over and over again! Thank you for everything you do for us, and have done for so long! Posted December 25th, 2017 at 2:40 am | Log in to reply. Posted September 23rd, 2017 at 1:55 pm | Log in to reply. I am Valeria and I have a doubt. Fist of all, I live in Mexico City. Second, I tried to look for the “all purpose flour”, but I couldn’t find it, instead, I tried it with “wheat flour” and, at the begining, it looked similar, but when I cooked it, it didn’t looked like yours, it was like bread. Can you please help me to know what kind of flour I have to use? Posted October 12th, 2017 at 7:41 pm | Log in to reply. This recipe was originally posted on August 29, 2014 at 9:17 pm by Maangchi. It was last updated on May 27, 2016. The video was watched 1,192,586 times on YouTube & has 16,423 likes!